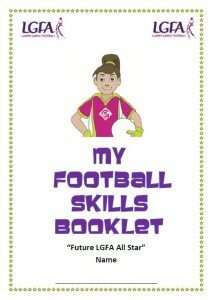 LGFA have devised a coaching resource booklet to encourage your club underage players to practice their skills at home and remain physical active outside of their weekly coaching sessions. This booklet currently focuses on players at U8/10 age group. We hope that this booklet will give all players the motivation to try and reach their full potential, both on an individual and team level and upon completion who knows, it might, one day, act as a stepping stone to greater arenas!!! Anything is possible with willingness and a positive attitude! So why not try it out and let us know how you get on!!! !